Tipical country house. 5 rooms. 6 pers. 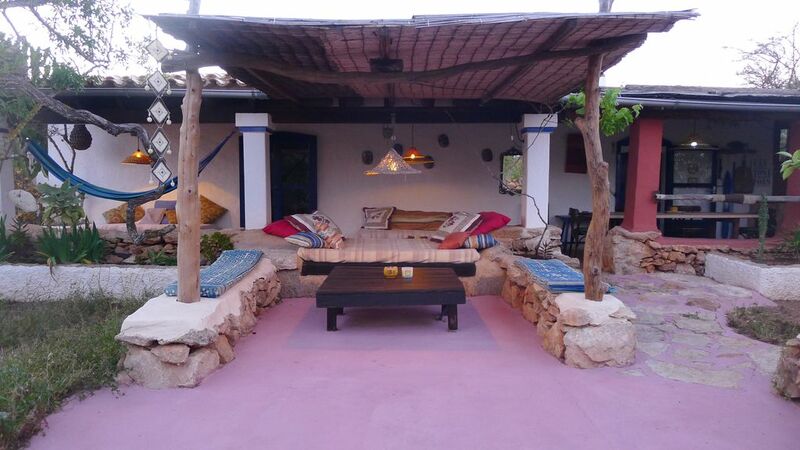 classic Formentera style house has all modern conveniences. Fully furnished and well decorated through out. The house sleeps up to 6 people comfortably. A weekly change of bed linen and towels are supplied. (ADSL+WIFI)connections are available. CD player. Television. The house has a large private garden of 10'000 sq feet with barbeque and 3 person Jacuzzi. Independent parking. Owner is available for maintenance services. environment, which is ideal for families. The house is located in the countryside a 5 minutes drive from Cala Sahona Beach and a 2 minute drive from a local restaurant and convenience store. Fantastic Vacation in Formentera!all is fantastic! Thanks a lot for your appreciation. It is very important for us to know your opinion to constantly improve the comfort of your stay. "Quiet, cool, spacious house lovingly looked after by the de Geofroy family, who are excellent hosts." Formentera is located south of Ibiza. Plane or ferry to Ibiza. Fast ferry ( rapido ) or car ferry from Ibiza to Formentera. Car ferry from Denia, mainland Spain to Formentera. The usual meeting point is at the Bar Es Cap. From the port, drive to San Francisco Javier ( direct ). Passing main street San Francisco, drive direction to Cap de Barbaria and Cala Sahona ( direct ). Arriving at the cross road to Cala Sahona, you will find the Bar Es Cap and a grocery shop ( about 3 miles from the port ). The house is 1 minute driving from the Bar Es Cap. In case you rent a scooter, we will comme to the port to bring your luggages at 'your' home. Formentera has many miles of unique, turquoise, Mediterranean Beaches many with beach bars serving food and drinks. The interior of the Island has a number of small roads bordered by handmade stonewalls which are unique to Formentera. It is highly recommended to have transport to experience this little paradise.